- Hard drive that stores up to 30 minutes of programming. - Ability to pause real-time broadcasts. 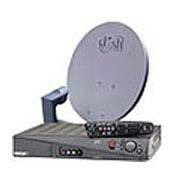 - Access to over 230 satellite channels. - Surf the internet with the internal 56K modem, giving you access to an almost uncountable number of websites. - RCA A/V input jacks for connecting a camcorder or digital camera and a mini-phone-plug microphone input, features that allow you to add sound and pictures to the WebTV email you send. - Optical output for Dolby Digital decoder and parallel port for a printer. - Remote control that operates both the receiver and your TV set. Thier biggest strenght, given Dishnetwork's lying and inability to fix th blanking bug (gone on for 2 years) is that because it is a WebTV system, They can not be ECMed. If you are into that kind of thing, then the 7100 is the one to buy. Blanking out video/audio for 2-3 seconds about once every 1.5 to 3 hours. I bought 2 of the 7100s when they first came out because Dishnetwork assured me (not in writing of course) that the PVR functions would be free when they finally got them working. Well guess what, not for free, not even a 1 time charge but a monthly charge! I like them except that all 7100s have a bug that causes the picture and sound to blank out for a couple of seconds several times a day. MOST ANNOYING! The software that runs this things is on the boarder of being criminal. This dopey company should have never let this thing out on the market. Bottom line, this system is more flakey than people from LA. DirecTV, I''m coming back home even though your now echostar. Has Optical and S-video connectors. Goes into weird modes and stops working. Have to unplug power to reset. When this unit works it actually works well. It has an onboard computer and like most computers it crashes. This unit is actually broken now. It won't power up and Dish Network won't make good on it. I'm unsatisfied as this unit has given me a lot of problems.